Rivaled only by the Gilmore Girls, the Kardashian-Jenner squad gives me the most excruciating food envy. Whether it's their signature XXL salads or decadent dinners at Il Mulino​, my cravings grow tenfold after a Keeping Up with the Kardashians binge. And despite these indulgences, Kim still manages to cut one of the most enviable figures in the game—yes, even when she's pregnant. 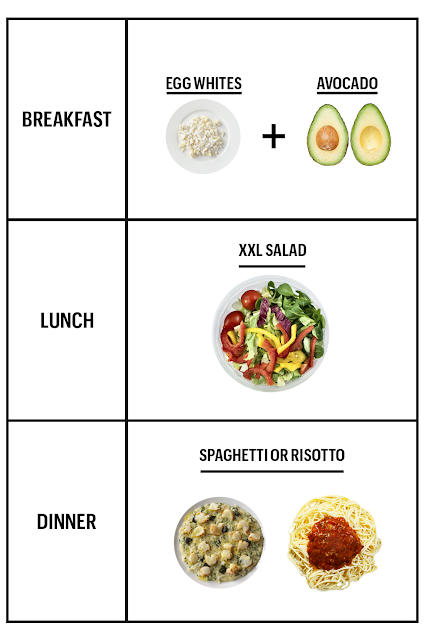 Here, we've outlined her daily mother-to-be diet in the graphic because while Kardashian may be eating for two, it's a menu any lone carb-happy gal can get behind.